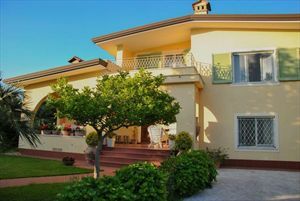 A detached villa with guest house, surrounded by a large park of over 4,000 sq.m., located in the most prestigious area of Forte dei Marmi - Roma Imperiale, at a distance of about 800 meters from the sea. The main building consists of a living room, kitchen and three bedrooms with en suite bathrooms. The guest house includes two bedrooms and two bathrooms. Ideal for a relaxing holiday. The villa is available for rent and for sale.